Bloom Energy's aptly-titled Bloom Box made a splash last year with much hooplah, bringing the likes of Arnold Schwarzenegger and Colin Powell to its unveiling. But while the promise of efficient fuel cell technology is great for the eco-minded and even the long-term penny-pincher, the mid-to-high six-figure upfront cost limits the potential customer base to only the upper echelon of the environmentally conscious. 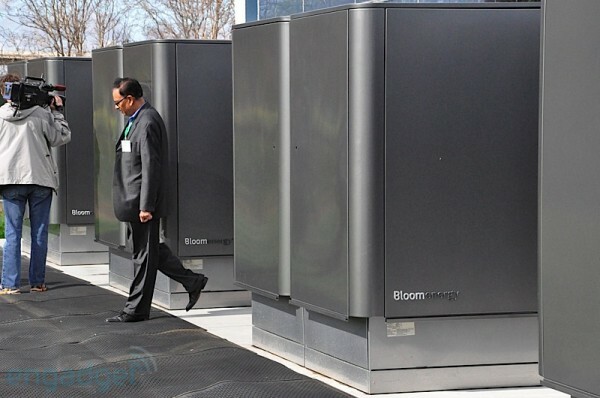 Cue Bloom Electrons -- instead of paying for the Bloom Boxes and owning them outright, you can lease a 2MW installation for no money down and pay only for the electrons you use. A 10-year contract is required, which yes does put your smartphone commitment to shame, but Bloom hopes this Credit Suisse / Silicon Valley Bank-backed plan opens the door for educational institutions and non-profits to join in on the phone. Press release after the break. Bloom Electrons' pay-what-you-consume service thinks outside the Box originally appeared on Engadget on Mon, 24 Jan 2011 10:14:00 EDT. Please see our terms for use of feeds.